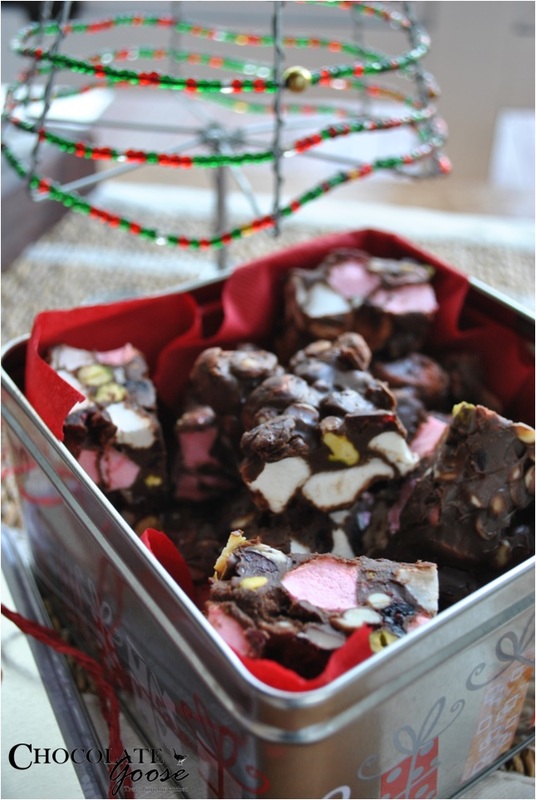 I hadn’t come across Rocky Road until we moved to New Zealand and was intrigued with what is essentially an unbaked slice of a massive amount of chocolate combined with all kinds of squishy, crunchy, colourful bits and pieces, making it look very interesting. It took a while for me to try it and although I don’t sample it very often, I had reason to try it again recently at a friend’s Baby Shower. That was a white chocolate one and was absolutely delicious. Another friend had a similar recipe and kindly shared it with me, so last week I finally got round to making my own batch. This recipe calls for Baileys, but as with all things, if you don’t have the exact ingredients to hand, substitute with something equally tasty…Cape Velvet worked just as well, but has a slightly different flavour, for obvious reasons. This was so yummy that I packaged some in gifts boxes for my son’s teachers as end-of-the-year-Thank-You-Christmas-Holiday gifts, but would work equally well being sold off at a School Gala or Church Bazaar stall. When I make this again I’ll probably cut back on the marshmallows a bit and increase the amount of chocolate to say, 250 or 300 g but everyone who tried this came back for seconds. Probably not the best for kids as the alcohol does give it quite a strong flavour as it isn’t cooked off, but there is such a tiny quantity that it certainly isn’t something to be concerned about. Melt the first four ingredients in a bowl over hot water. Beat until smooth and cool slightly. Stir in the next four ingredients. Line a swiss roll tin and press the mixture in, cover and chill. Melt the 100 g white chocolate and drizzle it over the top.